According to the International Energy Agency’s analysis, more than USD 221 billion is being invested annually into energy efficiency improvements in buildings, industry and transport in the G20 economies. More than half of this investment is into the buildings sector. UNEP FI has contributed to the G20’s Energy Efficiency Investment Toolkit, which provides guidance on how G20 countries can increase the flow of capital into improving energy efficiency, and includes insights and support from 122 banks globally, from institutional investors representing USD 4 trillion, and insurers who are signatories to UNEP FI’s Principles for Sustainable Insurance. For G20 countries who are responsible for over 80% of primary energy consumption and 80% of greenhouse gas emissions globally, energy efficiency and improved energy productivity are critical to the challenge of decarbonising their economies, achieving the goals of the Paris Agreement, and realising the significant economic, environmental and social benefits of energy efficiency in their economies in the most cost-effective way. Achieving these goals will require unprecedented collaboration between policy makers, regulators and the financial sector, to match the scale of the investment needed. As a significant milestone in the build-up to the G20 Leaders’ Summit scheduled on 7-8th July 2017, the G20 Energy Efficiency Finance Task Group (EEFTG) has launched its contribution to this year’s G20 energy and sustainability dialogue: the G20 Energy Efficiency Investment Toolkit. A joint consensus among public banks and development institutions around “best in class” instruments and approaches to scaling-up their energy efficiency activities. As no single stakeholder group can address the G20 energy efficiency investment challenge alone, this Toolkit provides a collaborative architecture through which G20 policy makers and innovators from different types of financial institutions can engage in a structured dialogue and jointly develop the new business and financing models which are needed to scale up energy efficiency investments. 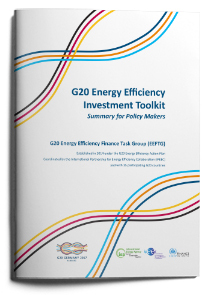 This toolkit is the culmination of three years of technical work of the G20’s Energy Efficiency Finance Task Group, with its 15 participating G20 countries (Argentina, Australia, Brazil, Canada, China, the EU, France, Germany, India, Korea, Mexico, Russia, South Africa, the United Kingdom and the United States), led by France and Mexico, as constituted under the G20’s Energy Efficiency Action Plan in 2014 and reinforced through the 2016 Energy Efficiency Leading Programme. Since the launch of the G20 Energy Efficiency Action Plan under the G20 Australian Presidency in 2014, this work has received continued support from the Turkish, Chinese and now German G20 Presidency. UNEP FI worked with its partners CDP, the Institutional Investors Group on Climate Change (IIGCC), Investor Group on Climate Change (IGCC), Investor Network on Climate Risk (INCR), Principles for Responsible Investment (PRI), UNEP FI’s Principles for Sustainable Insurance (PSI), and the European Mortgage Federation – European Covered Bond Council (EMF-ECBC). The Toolkit was referenced in the G20 Climate and Energy Action Plan for Growth adopted at the G20 summit 2017 in Hamburg. Read the Summary for Policy-Makers here. For more information on the toolkit, read Annie Degen’s blog, which highlights the contributions from private financial institutions and public finance institutions.